We’d love your help. Let us know what’s wrong with this preview of Going Local in Gran Canaria by Matthew Hirtes. Covering everything from places to see on your holiday to property advice and career opportunities, Going Local is much more than a travel guide. New residents will be delighted by its accessible, humorous st Whether you’re visiting Gran Canaria courtesy of picking up a last-minute bargain break or planning to relocate there, Going Local in Gran Canaria is the book for you. Covering everything from places to see on your holiday to property advice and career opportunities, Going Local is much more than a travel guide. New residents will be delighted by its accessible, humorous style and the inside scoop on what’s hot and what’s not, coming from British journalist and resident of eight years, Matthew Hirtes. “With a rare depth of insight, Matthew weaves his personal experiences through an engaging narrative to show us a different face to Gran Canaria." Victoria Twead, author of Chickens, Mules and Two Old Fools, Two Old Fools - Olé! and Mouth-Watering Spanish Recipes. To ask other readers questions about Going Local in Gran Canaria, please sign up. 'Going Local in Gran Canaria' is the type of book that would become dog-eared in a traveler's backpack or read feverishly by an expat moving to the island. It truly is a book that has something for everyone establishing residence or simply visiting. Matthew Hirtes manages to cover everything from starting a business and getting a mortgage to which restaurant to visit on a Saturday night, and how to get there. The book is peppered with enjoyable stories that others have shared with the author of t 'Going Local in Gran Canaria' is the type of book that would become dog-eared in a traveler's backpack or read feverishly by an expat moving to the island. It truly is a book that has something for everyone establishing residence or simply visiting. Matthew Hirtes manages to cover everything from starting a business and getting a mortgage to which restaurant to visit on a Saturday night, and how to get there. The book is peppered with enjoyable stories that others have shared with the author of their personal experiences on the island. It really adds a sense of the island becoming a home, not just a vacation destination. Useful phone numbers, addresses, and websites are included, and are all details that visitors and expats to Gran Canaria so desperately need. A very thorough look at life in Gran Canaria, both as an expat living there, and for a tourist only there for a short stay. Matthew has included contacts for surfing lessons to Spanish conversation and the only thing he seems to have decided to exclude has been the contact details for the local veteran’s football team, and that is only due to Matthew’s already limited playing time. I completely understand having not been able to find a place to participate in my local area. I have never visited A very thorough look at life in Gran Canaria, both as an expat living there, and for a tourist only there for a short stay. Matthew has included contacts for surfing lessons to Spanish conversation and the only thing he seems to have decided to exclude has been the contact details for the local veteran’s football team, and that is only due to Matthew’s already limited playing time. I completely understand having not been able to find a place to participate in my local area. I have never visited Gran Canaria myself but I would consider this to be the ultimate guide, for anybody wanting to move to this tropical paradise, or even just do more than bask in the sun during the annual two week holiday. I love to read the tales of travellers, whether they live in the country or are just passing through, but with one caveat, I like my travel guide to be inspirational and to inspire me to want to try it for myself and this certainly does just that. Matthew breaks down the Island perfectly, and looks at what you can do as a short break tourist or someone who is planning to spend the rest of their life there. What he demonstrates is that there is literally ‘something for everyone’ on Gran Canaria. I I love to read the tales of travellers, whether they live in the country or are just passing through, but with one caveat, I like my travel guide to be inspirational and to inspire me to want to try it for myself and this certainly does just that. Matthew breaks down the Island perfectly, and looks at what you can do as a short break tourist or someone who is planning to spend the rest of their life there. What he demonstrates is that there is literally ‘something for everyone’ on Gran Canaria. I used to be an avid addict of guide books, until I stopped travelling, so I have read more than a few. Consequently, it was a breath of fresh air to read a guide book that delivers so much more than the average. The fact that Matthew Hirtes is married to a lady from Gran Canaria gives the book an authentic flavour and an insider’s view, which is rarely found and that, together with evocative photographs and mini stories about the island from guest contributors, give “Going Local in Gran Canaria” I used to be an avid addict of guide books, until I stopped travelling, so I have read more than a few. Consequently, it was a breath of fresh air to read a guide book that delivers so much more than the average. The fact that Matthew Hirtes is married to a lady from Gran Canaria gives the book an authentic flavour and an insider’s view, which is rarely found and that, together with evocative photographs and mini stories about the island from guest contributors, give “Going Local in Gran Canaria” a multi dimensional feel making it stand head and shoulders above other books of its genre. The reader can find out everything they wish to know about the island but not in a boring and bland way. As “Going Local in Gran Canaria’ took me on a tour around the island I felt as if I were in a black taxi cab in London, with the friendly cabbie acting as a tourist guide, explaining where I was and what I was looking at and all mixed with a special dry wit which made me smile and even laugh out loud at times. 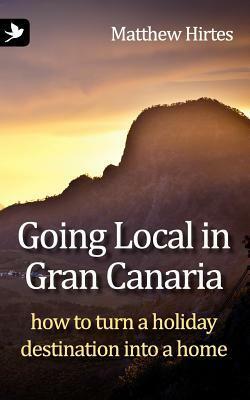 I can enthusiastically recommend this excellent guide book to Gran Canaria, which is thoroughly deserving of a place on the book shelf for those who are living there, those who have been there and who might want to go in the future. Having lived on the Spanish mainland for the last 18 years, you get to know when someone writes about your country from a point of fleeting interest, and when someone writes about it from a perspective of depth and insight. Mathew clearly belongs in the latter camp where he has not only written a unique guide to this fascinating island in the Canaries, but he has written it with an authentic voice. For lets face it, these days facts and listings about any location can be downloaded from umpteen w Having lived on the Spanish mainland for the last 18 years, you get to know when someone writes about your country from a point of fleeting interest, and when someone writes about it from a perspective of depth and insight. Mathew clearly belongs in the latter camp where he has not only written a unique guide to this fascinating island in the Canaries, but he has written it with an authentic voice. For lets face it, these days facts and listings about any location can be downloaded from umpteen web sites for free. But if you want to know more than just a phone number or address, if you want to know 'why' rather than just 'what'...then you need to ask someone who knows. And Matthew Hirtes is just that man. This guide book does just what a good guide book should do: Inform, explain, entertain, and in the very best of cases - as with Going Local In Gran Canaria - even inspire.